This post addresses three things: the importance of free thinking, my admiration of two of my feminist friends, and my argument that it is healthy to disagree with Church leaders sometimes as long as you still sustain them. Disclaimer: this is just my opinion. But I think that ideas are like wet laundry–they need to be taken outside and aired out or else they sit in a pile up in your cramped head and start to mold–so here are my thoughts about how I’m approaching my study of LDS feminism. More thinking is required, and we call upon you students [the address was at BYU] to exercise your God-given right to think through every proposition that is submitted to you and to be unafraid to express your opinions, with proper respect for those to whom you talk and proper acknowledgment of your own shortcomings. I want to get one thing straight before going on. LDS feminism is a risky subject to take up because it can easily go down the path of losing faith in Church leaders and leaving the Church itself. (I’m entirely convinced that that’s a bad idea. Even if the ship has some flaws, I still want to be onboard when it finally pulls into Port Zion, as it most assuredly will.) So it’s important to clutch the iron rod tightly if you choose to investigate LDS feminism. For me that has meant being extra diligent about reading the Book of Mormon daily and attending the temple frequently. 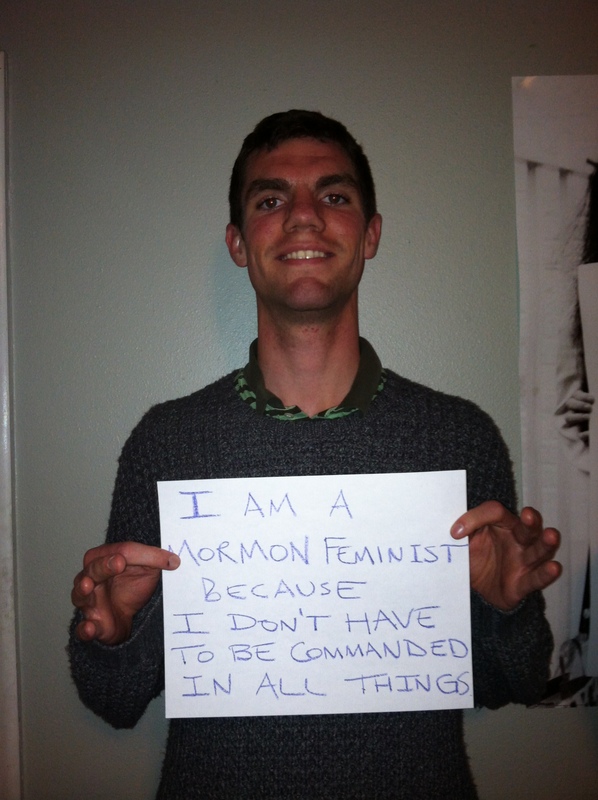 But if you are determined to pull it off, I also think LDS feminism is an important and rewarding topic to study. I’ll save the specifics for another blog post. Right now I want to say that I admire and am proud of my two very feminist friends who introduced me to this issue. They have remarkable poise, faithfulness, and courage to speak up for what they believe is right. I also want to identify a lie that often works its way into this discussion. There is a false dichotomy going around that Saints must either think everything their leaders do as they govern the Church is right or they must stop sustaining them. This may be a principle that is as widely misunderstood as the commandment not to judge. We could go along in life pretending not to find fault with our neighbors and relations, inventing righteous reasons excusing their behavior. But to judge righteously is to recognize faults in others and to love them anyway. That is the higher law, which combines an observation of the world as it really is with a merciful and loving response. We should be spiritually mature enough to see our leaders’ talents and service and be grateful for them and when we see fault, to love and sustain and follow them anyway. Doesn’t God see our faults perfectly and still choose to have faith in us? Do we have a responsibility to take seriously the reports coming in from the feminists among us that gender roles even in the church could be improved so that needless suffering may be eliminated? Yes. Gender roles in the church are imperfect, even as the Church is imperfect and this very world is imperfect. We should not be surprised if additional light causes us to see problems that were previously unknown. It’s the revealed gospel with its doctrines, principles, and the corresponding priesthood authority that is always true. So as faithful Latter-day Saints, let us follow and sustain President Monson and all the Church leaders. In all sincerity, we thank thee, O God, for a prophet. And let us cultivate active minds at the same time, ready to receive light and knowledge wherever we can get it so that we can better support each other. Sometimes that light may come from the feminists among us. Gabriel, thanks so much for your post. I’m really glad to have your perspective here. Personally, I feel like the line (if there is one) between doctrinal clarifications and doctrinal changes is difficult to distinguish, which may lead some among us to believe either that truth is not constant or that the doctrine is not always true. I’m really glad that this is a forum where each of these perspectives can be freely expressed. As you pointed out, reasoning together and attempting to adopt multiple perspectives usually leads us to understand much more. Thanks again for joining the community. I’ve appreciated your contributions. Great thoughts! The idea that we can disagree with but still sustain is completely true – we are all human and have our own strengths and weaknesses, and the prophets and apostles are no exception! I love how Pres. Monson (and others) is willing to share his own shortcomings and how he learns and grows from them. No one is perfect! And things can always be improved. This was exactly what I needed to hear tonight. I have been feeling so lonely and wondering if the doubts and issues I was having with the Church made me a bad person or meant I was a hypocrite if I tried to stay active. Thank you so much. I didn’t see your comment until today (I thought this article had gone fairly unnoticed) but I’m glad you got something you needed from it. Thanks for sharing your experience.